Description: My first shot of a GEVO, this one idling in Calwa Yard. Description: All four engines throttle up in an attempt to bring their priority intermodal train to track speed. 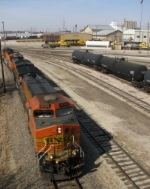 Description: New orange engines slide past the good stuff at the BNSF Topeka Shops. Description: BNSF Slaton, TX to Denver, CO manifest train H-SLADEN1-17A slow rolls through the 11,500 foot 10 MPH siding at Finney on the BNSF Plainview Subdivision. NS 9972, BNSF 7697, BNSF 4874, BNSF 4809, 62 loads, 44 empties, 9322 tons, 6910 feet with power, ETD BNQ 42699. Description: BNSF 7697 at the Norfolk Tracks, Seattle, WA.